← Mommy’s New Tattoo available for pre-order! last sunday, i was taking a stroll with my special lady friend through one of my favorite strolling neighborhoods in SE. we had just been talking about how all kinds of stuff happens with urban farming here that doesn’t really happen in other parts of the country. like how in detroit a person got arrested for driving down the property values in their neighborhood by having a garden in their front yard, even though their neighbor’s yard was full of gnomes and assorted impromptu statuary. so, we admired the raised beds, the flowerpots and flowerplots. the homely beginnings of a handcrafted trellis leaning crooked by a sidewalk awaiting installation in a yard. the single bloom of a cherry blossom looking thing peeking through the overcast velvet stage curtains of early march on an otherwise barren tree. another thing about portland that one doesn’t find everywhere are prolific numbers of gentle house pets wandering the streets. especially cats. these well-loved, chubby, fearless things roam around their little territories on the hunt for affection. occasionally i see one go for a bird or squirrel. but more often i will be walking and see some fat, furry belly which has turned itself skyward at my feet languidly. completely trusting, used to love from strangers, persistently jogging to re-flop on the ground in my path if i somehow forget to stop and pet it. on this sunday we saw the usual number of cats patrolling. 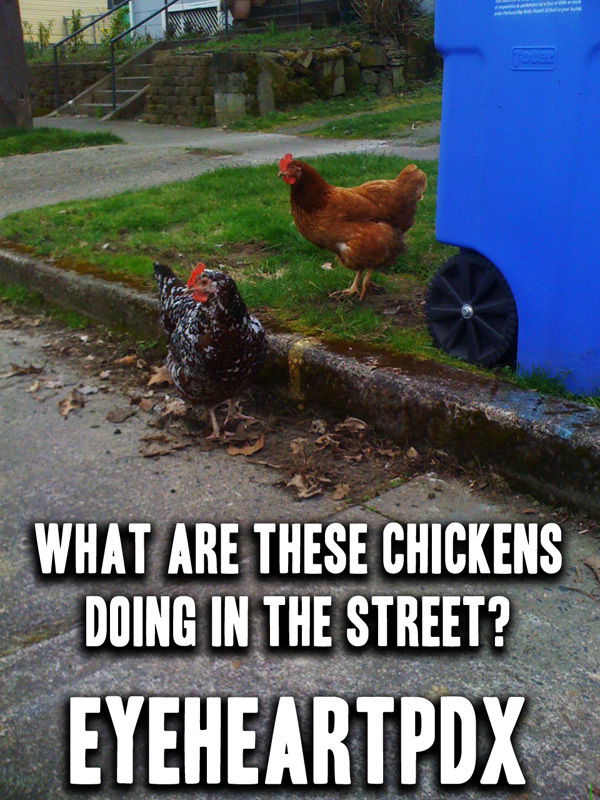 and then around a corner by the recycle bins were two chickens. they hadn’t come from anywhere obvious. they were completely unafraid of us, and didn’t even look up from pecking the the dead leaves and dirt by the sidewalk until i clucked at them. it was remarkable to me, not because i was in the middle of a city and there was a couple of docile free-range chickens just loitering. you live in portland long enough and this isn’t exceptional. my first thought was where i’m from, these two would have been found quickly by a roving pack of dogs. heck, even a lone cat would have taken these two on, at least to warn them off their turf. but even the three or four cats on that block paid them absolutely no mind. so, i took a couple of pictures, clucking like an idiot. and as we walked away, i looked back and saw the two of them crossing the road. slowly. like many portland pedestrians, they ambled free of worry or notice of their surroundings, and without looking both ways. on the other side of the street, they resumed pecking in a pile of leafy debris by another recycle bin. it wouldn’t surprise me if this was their daily habit, on the barely trafficked residential streets of southeast pdx, and they probably went home someplace without a scolding as long as they were in by the time the street lights come on.